The university will be able to produce enough sustainable electricity to completely offset its carbon dioxide emissions. 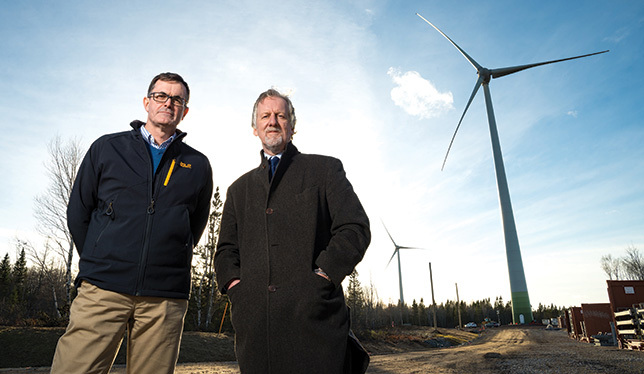 The wind turbines rise up behind Donnie MacIsaac, director of facilities management at CBU, and president David Wheeler. Photo courtesy of Cape Breton University. Change is in the air at Cape Breton University as the school embarks on what it claims is a North American – and possibly a global – first for a university: opening its own wind farm. By building a three-turbine, 5.4-megawatt wind farm on its campus, the Nova Scotia institution will be able to produce enough sustainable electricity to completely offset its carbon dioxide emissions. This renewable energy will be fed into the provincial power grid, which will reduce the need for Nova Scotia Power to burn coal for electricity. It will also generate revenue for the university through a provincial government program designed to promote community-based renewable energy projects. The idea for the facility was prompted by the province’s introduction in 2010 of a community feed-in tariff program, which pays a guaranteed premium rate per kilowatt-hour for energy fed into its electricity system by small-scale, green-energy producers. During its 20-year contract with the province, the university will receive 13.1 cents per kilowatt hour for electricity it produces, which will generate about $2.1 million in annual revenue. Each year, the wind farm will generate about 16,200 MWh of electricity, which equals a savings of 15,000 tonnes of CO2 emissions. CBU’s annual carbon output from all of its energy sources totals about 8,000 tonnes. Being developed in partnership with Halifax-based renewable energy development firm Natural Forces Technologies, the $17.6 million facility was scheduled to be up and running in mid-January. The project is a part of a broader effort by CBU to embrace sustainability, both in how it operates, and in the programming it offers. Working with energy efficiency advisor Efficiency Nova Scotia, the university has introduced more energy efficient lighting, ventilation and water treatment systems, low-emissivity ceilings, and campus-wide sub-metering of energy usage. Combined, these measures have led to annual energy savings of more than 1,400 MWh. In addition, CBU is home to the Verschuren Centre for Sustainability in Energy and the Environment, which provides companies with clean technology R&D services. The university also offers eight academic programs focusing on areas such as sustainability, energy efficiency and natural resource management.